JuanaMikels.com: Pics/Clips & What I Learned at Beth Moore Live Last Weekend! Pics/Clips & What I Learned at Beth Moore Live Last Weekend! 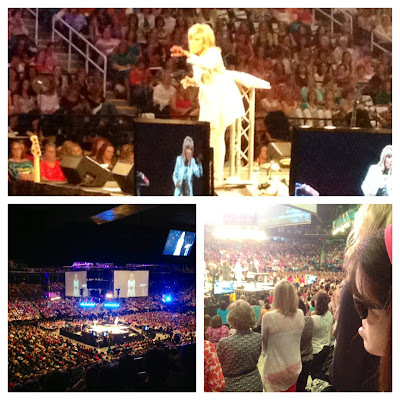 What a wonderful time the women from my church had when we went to see Beth Moore live last weekend! Unlike most in our group, I had never heard her live. I was thrilled that my daughter, Mary, went with me and we loved our pj party we had in our room. It was just Kentucky Fried Chicken and us for dinner before we met our group in the hotel lobby to head to the arena where Beth was to speak! I have much to tell you about what I felt God was saying to my heart. It's not what you think. I loved Beth and her worship leader, Travis Cottrell, and so enjoyed having an extended time of worship before the teaching began. But even before Beth began her first talk, I could sense that God was already showing me some things He wanted me to learn. You see, I have been corresponding online for about a year with a person with Lifeway who is in Women's Events. Well, it was more like I was writing her, and she would write me back. Eventually, she had me send some sample Cd's of my teaching to her. Later, she contacted me and wanted to "pencil" me in to speak at a conference for moms, pending confirmation from someone on her team/staff. I found out that my sons (who attend the same college) had their parent's weekend the same weekend of the mom conference, and knew that wild horses couldn't keep me from being with my boys when they want me around. Well, I needn't have worried about any sort of conflict because I never heard back from anyone about the mom conference. I sent my contact a note saying I would love to speak at their mom event, but had the conflict of my sons' parent weekend (but I'm not sure they were going to confirm it anyway!). I was so disappointed because I grew up going to the Baptist Book Store, (which later became what we know today as Lifeway) and I was so thrilled at the very thought of teaching an itty bitty seminar at one of their regional mom conferences. I adore the quality of Lifeway resources! I love their store! I had offered to speak on a few topics, but really wanted a chance to speak to special needs moms, and was hoping for an opportunity to teach a small seminar to encourage that select group of moms. Now you know where I was coming from. So when I sent that email saying I couldn't be free that weekend, I felt like I was telling the President I couldn't come to Camp David even though he really never confirmed my spot at Camp David to begin with! So back to my first Beth Moore Live event last Friday night. We got to our seats, which were—oh by the way—absolutely fantastic. I look down and the first person I recognized in a sea of women is my contact at Lifeway. She is dressed in solid black and had one of those walkie talkies that told me she was really busy. Really busy. I had this huge desire to meet her in person. She was the one who had been so optimistic in our first correspondences. Besides, she had told me she was from my home state. I did go down and meet her and she immediately wanted to meet Mary. We scooted over close to where our seats were but when she realized we were seated upstairs, she told me she wasn't allowed to go upstairs and had to stay on the floor. But she did see where Mary was, and knowing that Mary is totally blind and partially deaf, she asked me if it was too loud for Mary or if we needed anything. We didn't; we chatted a bit more and I went back to my seat. "Juana, why are you trying so hard to move to the next step? Don't you know that I can do anything? Don't you know that I am the One who closes doors? The One who opens doors? Why are you striving so in your own strength? Why don't you just come to Me about these matters instead of trying to go to other people? I know things that you know nothing about. You don't have to be sure that you talk to the right people and be at just the right place, for I look to and fro the whole earth to see whose eyes are turned toward me! That's what I want! Don't you want what I want? Do you want to want what I want? That's your part! So keep loving on Mary right now, and worship Me. Know that I am God, and I make everything beautiful in its time. Enjoy being with your Sisters right now and the beauty of adoring Me together as you all lift your hearts up to Me along with thousands that are in this very room who love Me just for Me. Enjoy my servant Beth, and don't be jealous of her but happy for her that I am using her in the way I created her to be used. Jealousy doesn't bring about the righteous life that I desire for you. You see when you are happy for Beth, you can have a pure heart. I want you to have a pure heart because then you will see Me. I made you to be Mary's mama and when you help her and tell her the words on the screen or describe what's happening in the video, I take great pleasure in you. Cease your striving and just do the next thing in front of you that I've given you to do. Your part is to trust, my part is to work." I don't know how God had time (doesn't that sound silly?) to tell me all this when 8000 women were in the room, but then that's what makes Him God isn't it? I immediately felt such calmness and peace, but still with the excitement of getting ready to worship the One who made us, the One who took time to speak to me in the midst of a crowd, like the time He spoke to the woman who just touched the hem of His garment in the midst of the mob. He is able! He cares about the details of our lives. My life. Your life. Once again, God replaced my anxious, wandering heart with His presence! The ironic thing is Beth hopped up on the platform in her cute white skinny jeans and told us the word for the weekend was "secrets." Secrets! He had just whispered one in my ear! I heard His voice over all the pre-festivities music and the stimulation of 4 jumbotrons and video screens everywhere plus colorful bouncing balls going from audience member to audience member (which I had been taking it all in and describing it to Mary the best I could! You will actually see it in a clip below). "Surely you desire truth in the inner parts; you teach me wisdom in the inmost place." Wow. That was what God was telling me alone with Him just moments before the session began. The very same message. Come to Me, Juana. I have much to share with you one on one in that inmost place with just Me. So if my blogs seem to be a little shorter or a little less often, I hope that means I'm spending more time one on one with Him. By God's grace, I want my time with Him to linger more. No time alone with God is wasted time, amen, Sister? Hopefully it will affect what I otherwise would have posted. Be authentic with all, transparent with most, and intimate with some. Enjoy the pictures and clips below! 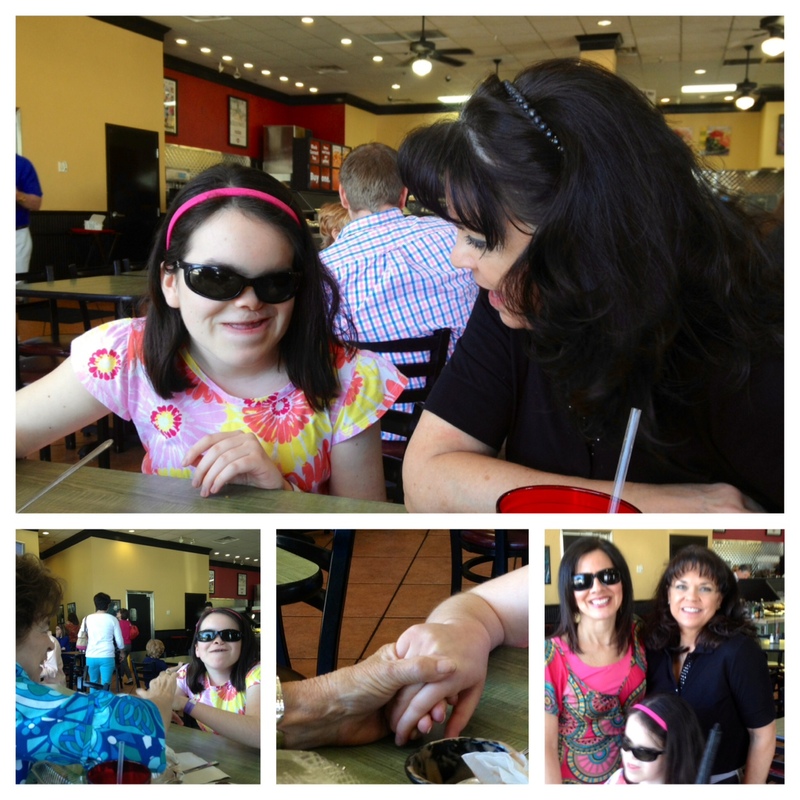 plus Angie's little girl, Lyla---a future Bible study goin' girl for Jesus! Holly, Addie, Joan, Betsy, Sarah and baby Laney were somewhere in the back and missed our group pic! to Travis Cottrell that was only for his ears. Sorry so grainy, but it was too cute! That was our topic: secrecy! Beth was everywhere! It was so neat hearing God's word go out in the halls. I kept thinking that even the arena staff were being blessed! with her blue skinny jeans, with of course—heels! She looked so pretty! who live in Greensboro where the event was! So fun seeing them! If you can't get these clips to play on your phone, try viewing on your computer! They are each very short. In the last one below, Beth asked people who had never been saved who wanted to be to call out their name to Jesus! This had gone on for a few minutes before I filmed it through my tears as nearly all were crying. 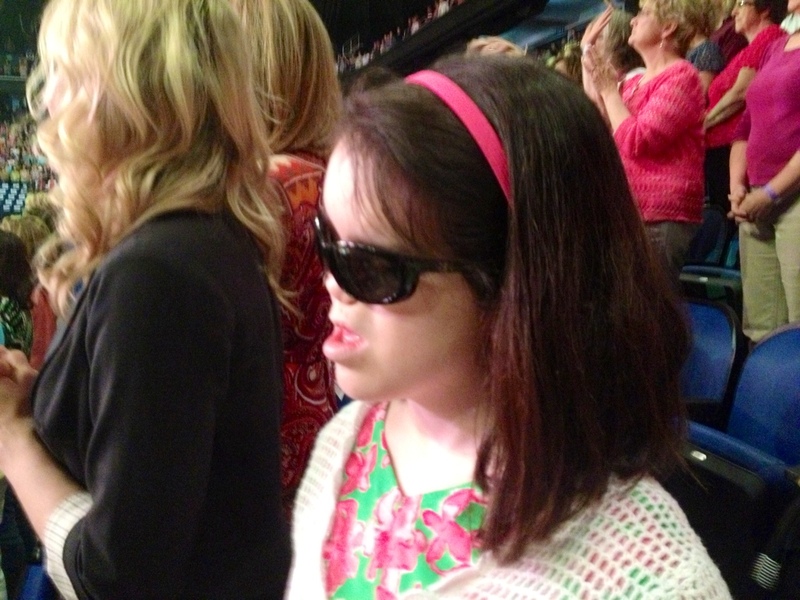 This was Mary's favorite part at the event! The angels were rejoicing! One of my favorite parts was at the very end. Beth had us gather in groups of 2 or 3—my partner was Mary. Each group held hands and repeated a prayer of relinquishment to God about secrecy in our lives and being in the secret place alone with God. Let me know if you want me to give you that prayer. Thank you for this today, I needed it. Oh, Jana, I'm so glad it spoke to your heart. Blessings to you! I mailed the giveaway you won out on Saturday, so be watching your mail! tears as I read what God whispered to you in the midst of the big conference. . thanks for sharing. . .I needed to be reminded of that. . .so enjoyed this post. I appreciate who you are. I appreciate you Su, more than you know. Just meeting you at She Speaks and knowing we both share a love for the Lord, and a love to minister to other women is a forever bond:-) I too, appreciate who you are and hope that you share your beautiful organizational and shopping tips on my Wednesday link up party every Wednesday. Blessings! I loved all that you shared about your trip to see Beth Live. I love how God spoke to you. I also love your writing. You are a treasure to not only your daughter but to to everyone who reads your words. Thank you for sharing. i just commented,but not sure if it will come through.. Yes it did, Joy! Let's pray! Father God, I lift up my sister Joy to you today, this day of national prayer in our country. Lord, the harvest is great and the workers are few, and Joy wants You to use her as You will for Your purposes. She is open to whatever You have for her where she lives. Guide her Lord, as only You can do the the exact place of ministry that You would have her serve, to be used for Your kingdom purposes as You see fit. In is the in precious name of Jesus that we pray this, Amen.